Intiwatana It was in Intiwatana, the solar astronomical observatory, the highest point of the city of Machu Picchu, where this race of people developed the study of the universe and were able to develop the calendar, dividing the year into 365 days, 52 weeks, 12 months, the months into days, the days into 24 hours, and the hours into 60 minutes, exactly as we know it today. Here, especially we are able to feel the vibration and the presence of extraterrestials. Many spiritualists who visit Machu Picchu perform rituals to connect with their space brothers and sisters at Intiwatana.To know Machu Picchu is a dream for so many, and today I can understand why, because only through experience are we able to comprehend its power and energy. 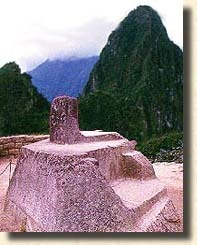 Unfortunately, the archaeological studies of Marino Sanchez concluded that Machu Picchu does not have a long life. This is because the movement of the earth each day affects in some way the structure of the mountain and, consequently, of the city. Therefore, it is the premise of Marino Sanchez that in the near future, there is a great probability that Machu Picchu will come tumbling down. This saddens me deeply, so I can say no more about Machu Picchu here. Now I will continue on to the Sacred Valley of the Incas, Urubamba. The Urubamba Valley's is one of the most fertile valleys on this planet where everything that is planted grows with such abnormal vigor, especially corn, which grows to approximately three times the size of the corn grown here in the U.S. and other parts of the world. 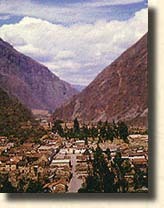 At the end of the Urubamba Valley, lies the ancient Inca village of Ollantaytambo. 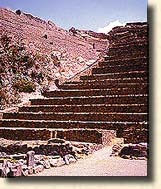 In Ollantaytambo we find the Lemurian Temple of Love, which was also known to the Incas as the Temple of the Sun. A profound energy is experienced here in connection with six enormous pink stones that were mysteriously transported to this place. The vibrations are so strong that by simply placing hands on the stones your body begins to pulsate and vibrate. Many people who have visited here sense there is a stong UFO connection and/or contact with the Pleiades. Well, there is much more to see and say about Peru. After my first contact with Chuma, I received a message to change my entire life and begin to organize metaphysical groups to offer the opportunity to others who dream to visit Peru to help them realize their dreams and to enjoy their own experiences to be able comprehend and understand why we compare our lives before and after Peru. Peru, the Mystical Country, or the Message Country, . . . because mysteries will continue to be a mystery for those who do not want to comprehend the underlying messages and know that mysteries do not exist, only messages. It is waiting for you to reveal its' message. Come join us! I offer this article to CHUMA, my spiritual guide, who works with me in everything relating to Peru.